The Pocono Mountains Music Festival is a multi-art-form organization that presents an annual summer festival, as well as educational performances throughout the year. 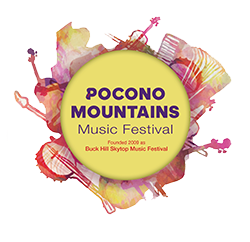 Founded 2009 as the Buck Hill Skytop Music Festival, the Pocono Mountains Music Festival showcases seasoned and up-and-coming performers in chamber music, cabaret, jazz, pop, and musical theater on select date June, July and August. Intimate performance venues allow audiences unparalleled access to world-renowned musicians.